BRIGID KAELIN is a singer, storyteller, blogger and multi-instrumentalist who has appeared on BBC, NPR and received many "Best Singer-Songwriter" awards in Louisville, (she is also Elvis Costellos musical Saw player of choice). With 7 albums/EPs of original alt-country-cabaret music, she's toured the world. Brigid's live show is entertaining, upbeat, but poignant. The addition of Steve Cooley lifts her originals, making the show reminiscent of old-time variety hours. 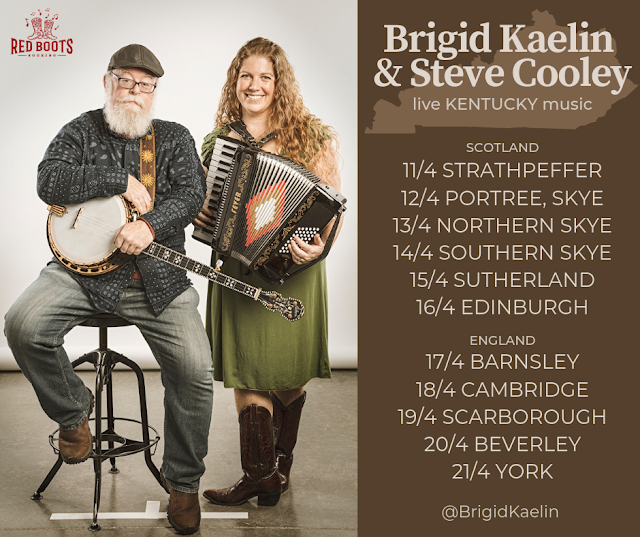 Also a sought-after sidewoman, Brigid has performed with artists ranging from Nick Keir and Adam Holmes to Elvis Costello, usually on musical saw or accordion. Brigid says of the coming tour.